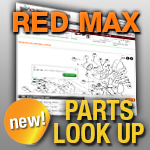 RedMax Mufflers: Need a new muffler for your RedMax chainsaw or leaf blower? Jack's is the place! We have the replacement RedMax mufflers you need.